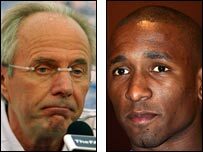 Former England coach Sven-Goran Eriksson has defended his controversial decision not to take Tottenham striker Jermain Defoe to the 2006 World Cup. Eriksson chose Theo Walcott ahead of Defoe and despite injury doubts over Wayne Rooney and Michael Owen. England went out at the quarter-final stage and Walcott did not play at all. But Eriksson said: "Jermain had a very bad season. I don't think he deserved to go to the World Cup. Taking Theo was the right decision." Eriksson added: "Where are the other good English forwards? I saw 100, 120 Premiership games every year and I couldn't find out." 606 DEBATE: Did Defoe deserve to go to the World Cup? And he admits he still feels England should have gone further than their last-eight defeat on penalties at the hands of Portugal. He said: "Maybe I should have taken on a sports psychologist for the taking of penalties. I know many Premier League clubs work with one. "We shouldn't have lost to Portugal. Even today, I think we should have reached the final." Eriksson failed to make it beyond the last eight in three major tournaments but stated: "If you look at the whole picture I think it was a good five-and-a-half years. I think we did rather well."